"The New Era of Multi-Messenger Astrophysics"
SAVE THE DATE: ASTERICS-OBELICS workshop New paths in data analysis and open data provision in Astronomy and Astroparticle Physics. 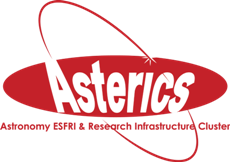 On 14 & 15 March 2018, the Astronomy ESFRI and Research Infrastructure Cluster, ASTERICS, organized an event for its developers and contributors to discuss their work. Announcement: 2nd ASTERICS – OBELICS Workshop, 16-19 October 2017, Barcelona. 2nd ASTERICS – OBELICS Workshop, 16-19 October 2017, Barcelona. Collaboration call to encourage the partnering process between ASTERICS members and industries. ASTRON-JIVE news Summer Edition 2017: Become a Muon hunter. Announcement: 1st ASTERICS-OBELICS International School, 6-9 June 2017, Annecy, France. 1st ASTERICS-OBELICS International School, 6-9 June 2017, Annecy, France. Announcement: 1st ASTERICS – OBELICS Workshop, 12-14 December 2016, Rome. 1st ASTERICS – OBELICS Workshop, 12-14 December 2016, Rome.